Oh, I’ve found something really, really fun today over at my writer friend, Robyn Hood Black’s Etsy shop! She’s taken her artsy skills and created artsyletters! Which is…well, let’s ask Robyn, shall we? 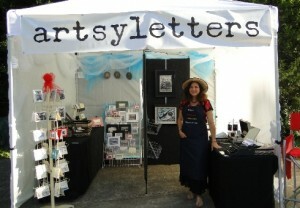 Robyn, I saw a pic of you recently, surrounded by your artsyletters wares. What exactly have you created in this new venture? LOVE this idea! So what’s the inspiration for your artsyletters? I still love writing, of course – poetry, fiction, nonfiction – and speaking, but I needed something to supplement the income from that, which can be, um, sporadic. I’ve always had an entrepreneurial bent and actually had an art business in my life B. C. (Before Children). Now I’m recruiting those aforementioned pretty-much grown children to help with this new endeavor! Wait – is that laughter I hear about my supplementing an income by selling art? O, ye of little faith. Quit laughing. I can still hear you. Actually, once the idea to make art celebrating the reading and writing life emerged, my muse wouldn’t let me sleep! It seemed like a perfect way to tie together all my interests. I’ve rekindled passions from earlier in my life such as calligraphy and illumination, and for once I’m glad I’m a pack rat and kept so many of those resources. A trip up to a Highlights Founders workshop last year re-ignited a love for printmaking, and I find myself making pictures with all kinds of vintage books and other fun literary props. My new obsession with altered page collages has me picking up any intriguing piece of metal off the side of the road and paying perfectly good money for old typewriter keys and parts, letterpress blocks, and the like. I keep widening my “territory” to encompass new antique shops, in addition to discovering new vendors on Etsy! By the way, stooping to pick up little bits of abandoned treasures (old junk) here and there is a great way to make family members walk faster, in the other direction… . I’ll be adding more items in each category in my shop and have really appreciated the positive feedback I’ve gotten so far. Such a great gift for a writer! (Or anyone who loves letters, really.) How do we get our grubby little paws on them? I have an artsyletters facebook page, and next time my daughter’s home from college, we’ll get Twitter going, too! Oh, and for each purchase, I’ll donate a small percentage to literacy charities. Being able to read is a priceless gift, and I’m happy to celebrate it with all these fun creations. Thanks for helping me spread the word, Cathy! This IS a fun find! I’m looking forward to visiting your etsy shop, Robin, and getting a look at everything. I love reusing things like old typewriter keys and board game pieces to create something new, mostly because it gives me an excuse to dig through the shelves at all my favorite thrift stores. Best of luck to you, Robin! Wow! Thanks for turning us on to this! I love this idea. I’m going right over to her shop. May not buy just yet, because I’m poor, but will definitely keep it in my hat for Christmas. And, hey, I recognize that cabin in your header, Cathy. Very cool. And aren’t those cabins THE BEST? Ahhhh…. just looking at Cathy’s pic makes me smile. Better than Disney World for grown-up children’s writers. Thank you for sending me off in a new direction. Cathy, you are such a generous writer and person. Good luck to Robin. You always have such cool stuff on your blog! Donna, I don’t think I can take credit for this–Robyn provided the cool factor! Cathy – you got plenty of cool! ;0) Thanks for commenting, Donna. Late replying, but came right over after Robyn told me to. 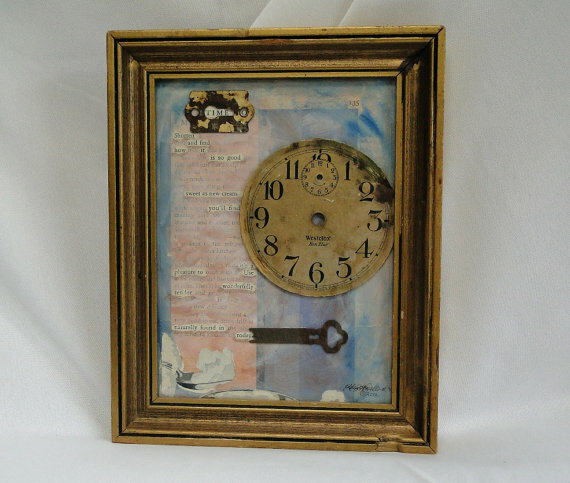 And wanted to say these poetry collages are wonderful that Robyn is creating. Congrats, Robyn! So appreciative of your comments ANY time, Linda – thank you for the support!